After signing up all users are initially given a Free Account. This type of account has a fairly limited feature set but allows you to try out Quickworksheets to see whether or not it suits your needs. You can upgrade from a Free Account to a Premium or Pro Account by either purchasing an annual prepaid upgrade, or signing up to a Monthly Subscription. You can compare prices and upgrade your account here. With a monthly subscription you pay a recurring amount each month. Your account will be upgraded for as long as your monthly payments continue. 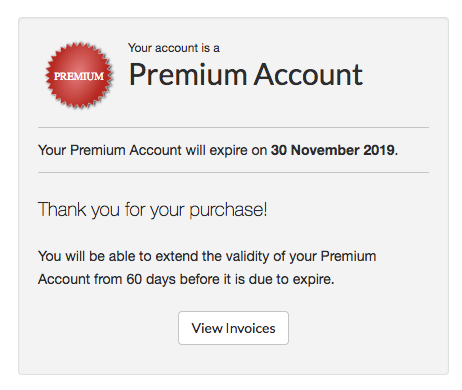 You can cancel your subscription at any time after which your account will be downgraded to a Free Account. 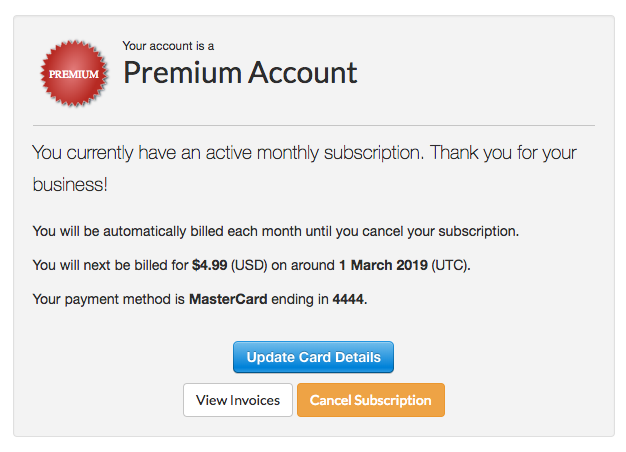 You can view your subscription information, update your card details (except for Paypal), or cancel your subscription from your My Account page. If your monthly subscription is a Paypal subscription you will need to log into your Paypal account to update your payment details. Example of information panel for a non-Paypal monthly subscription. With an annual prepaid upgrade you pay for a year in advance and get a discount compared to the monthly subscription price. When your prepaid period is nearing its end you will have the opportunity to prepay for a further year. If you choose not to extend your prepaid upgrade it will expire on the anniversary date of its purchase. You can view your Prepaid Upgrade expiry date from your My Account page. Example of information panel for a prepaid upgrade.